Experience this advanced early morning dive charter in Oahu! Beginning at 7:15am, you will meet your guide at the boat in Kewalo Basin, then you will head out to sea for your diving adventure. You will dive one to one deep wreck around 100 feet and a shallower reef for the second dive at 40-60 feet. All dives are led by either a Divemaster or Instructor, and will be in small groups to ensure the safety and enjoyment of all our divers. This excursion lasts approximately 3.5 hours. Meet up at the boat in Kewalo Basin, where parking is available right by the boat. The boat leaves when you are ready to go, no need to rush to maintain a schedule. Just come to have fun! When you are ready to go, you can head out and the tour is flexible to tailor what you want to see and do. Every dive site is known for different animals, let's try to find your favorites. Your first dive will be deep, around 100'ft that's why this tour is designed for experienced divers! The guides will help set up the equipment and maintain a safe, fun environment. The tour operator has a perfect safety record and a fun record! Since the wrecks are a bit farther from shore, you often see more Pelagic Fish, and sometimes even some dolphins and whales! 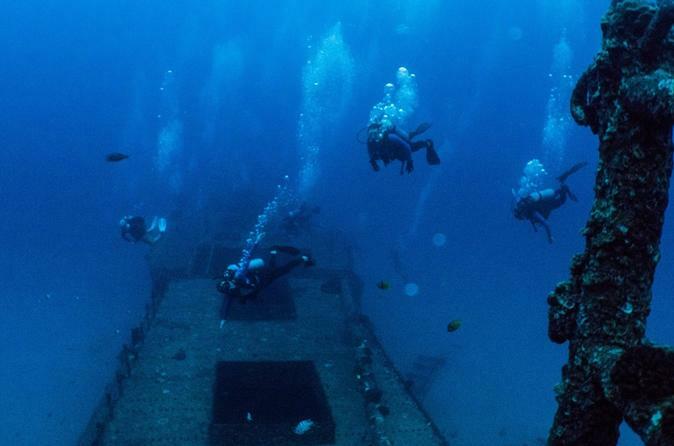 Due to the depths of the wrecks, certified divers should have a minimum of 25 dives, preferably Advanced Open Water and have dove in the last year.